The Wet Feet Program at CYC is designed to get new sailors comfortable around the water. The program largely focuses on making sailing a fun experience, and is taught alongside the Junior Sailing Program, but in a much smaller group of only 10 participants. Each session is one-week long and participants learn the basics of sailing. The program is designed for new sailors with no or very limited experience, and includes unique ‘Friday Fun Day’ events where participants sail to exciting locations once a week. Junior Sailing is an enriching sport that helps participants develop both teamwork and independence, while learning boating skills that can contribute to a lifelong activity for the whole family! We encourage kids to get started early with the Wet Feet Program, then grow into our Junior Sailing Program and Race Team options. CLASSES ARE SCHEDULED MONDAY THROUGH FRIDAY FROM 9:00 AM TO 4:00 PM. 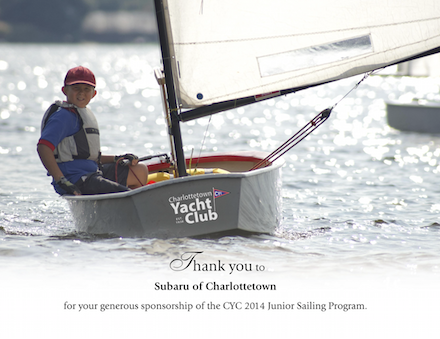 Charlottetown Yacht Club thanks SUBARU OF CHARLOTTETOWN for sponsoring the Junior Sailing Program! 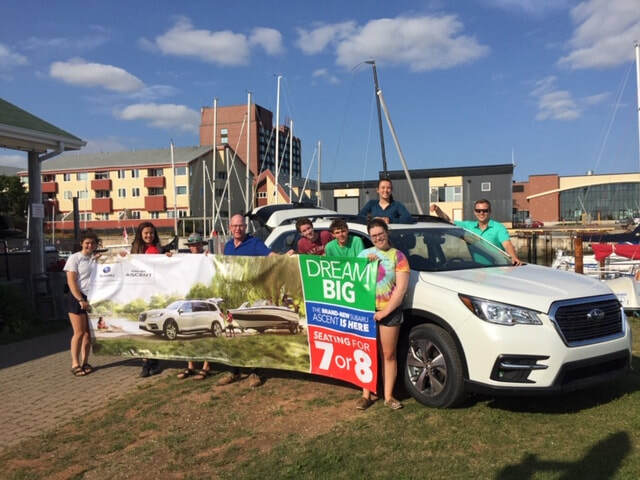 In 2018 with a Subaru Ascent: ( L-R) Race Team Coach Annie Dysart, sailor Maya Schmidt, sailor Wyatt Thompson, Co-Director Peter Bethune, Instructor Isaac McCardle, Instructor Ben Keizer and Head Instructor Sarah Bethune. Instructor Lily Balderston Simmonds and Subaru of Charlottetown General Manager Janson Simmonds are in the back row.